Back in 2001, I studied a semester abroad in Argentina. One of the excursions we took was to the Andes Mountains, specifically Mt. Aconcagua, the highest mountain in the Western and Southern hemispheres. I didn’t climb the mountain or anything, but I was hiking in its general vicinity. It was during this hike that I crossed a very small river that was rushing too fast. My support rock shifted, and I fell. It was later revealed that I had broken my ankle, but not in the normal way. You know that little bone that forms a bump on the outside of your ankle? I broke the tip of mine off. It never healed right, and even though it makes for a cool story, I still have problems with it to this day. Well, we watched the firefly display (which was so amazing that it deserves its own post) and began to head back to camp. It was very dark by now, and it started to pour down rain. It rained so much that everyone was immediately soaked, even if they stood under the trees for shelter. I was so wet that I honestly thought I’d never be dry again. And then I found that one uneven bit of path that only I was destined to find and took a major tumble. Normally if I twist my ankle it stops me for a second and I can keep going. But not this time. This time I was on the ground, in the dark, in the rain. I didn’t cry or scream or cuss, but I did leave reality. While sitting in the mud holding my ankle, I noticed that the rain stopped. “At least I’ve got that going for me” I remember thinking. But then Logical Robot Brain stepped in and reminded me that I was just too distracted by the pain to notice insignificant things like rain. (Logical Robot Brain sometimes likes to make things rhyme to keep me interested.) So I shook it off and tried to concentrate on my breathing and pain control. Boyfriend was with me, guarding me from the people still coming down the gravel path from the fireflies. (Remember, it was dark and pouring rain.) He’d shine the flashlight all around to make sure nobody tripped on me and caused further injuries. He was doing that for a while until someone actually stepped up to offer assistance. I didn’t get a good look at her, but I’m fairly positive she was wearing a makeshift rain hat out of a bucket, which signaled my brain to cue rainfall again. I thanked her and waved her away, because honestly there was nothing she could do. I just needed a moment to focus enough of the pain out of my body so that I could finish the walk back to the campsite and get out of the now neverending rain. Eventually I was able to, and once back in the tent, I toweled off, changed my clothes, and had some makeshift medicine in the form of whiskey. Here’s the part where I knew something was really wrong. My boyfriend and I were recapping the situation, and he said it was really nice of that lady to stop and offer help. I agreed, but I added that it took her long enough. Bf looked at me quizzically. “…She was right there as soon as you fell…” No way. I had definitely been sitting there for at least ten minutes, hating the rain and hating all the people passively passing by. But then I remembered how I had thought the rain stopped, and decided that bf’s memory was probably more trustworthy than my own pain-addled one. So that was a first. In all my many injuries (broken bones, concussions, etc), I’ve never had one that hurt so badly that it stopped time before. I don’t recommend it, btw. The next morning, we were packing up the campsite to go home. I was hobbling, but at least a little mobile. Definitely no 6-mile hikes that day (or for a while) but I could get around. On the way out of the park, we stopped at the visitor’s center, which as you can imagine, was full of people. My superpower of always being able to find the worst spot to step kicked in again, and because I was still brace-less on a weakened ankle, down I went one more time. This time I did yell a very loud “MOTHERF–” before cutting myself off and keeping it PG for all the kids around. While time didn’t quite stop for me this time, I did have to take a while to recover before I could put any weight on my foot so I could hobble to a bench and sit there for another long while. Then I had to drive us an hour and a half home, using my ankle way more than I would like since I drive a manual transmission car. Bf vowed to learn to drive stick after this, but since there was nothing else he could do for me, he researched the easiest and quickest way home. Thankfully, I had a few more days off from work (huzzah for birthday week!) but soon I had to return to normal life, which includes standing for 8 hours a day. I am currently still wearing the brace every day to work, but after a long day of cutting hair all the ibuprofen in the world doesn’t let me forget that I’ve still got an injury so bad that receiving it tore the fabric of time. 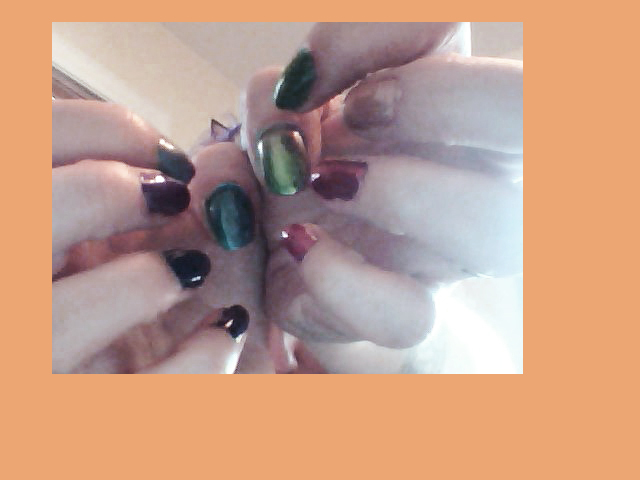 Sorry for the poor picture quality, but there was no other effective way to take a picture of all my fingers at once.